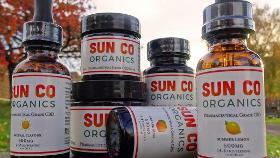 Sun Co Botanics has partnered with the largest grower, manufacturer and distributor of CBD products in the world. This partnership combines the talents of some of the world's leading scientists, chemists, veterinarians, formulators and experts in the Hemp industry. We guarantee that the hemp extracts Sun Co Botanics uses in our products are the highest quality and most bioavailable possible.